On the other hand, some administrators like the simplicity offered by the 3rd party applications. The companies that design these applications invest a great amount of effort to make their apps simple to use and feature-rich at the same time. These applications usually come with the nicely-packed interfaces and do not require much of the experience from their users. The drawback to this solution is certainly its price. Ola Hallengren’s maintenance solution could be considered a hybrid of these two solutions, as it takes the best perks from both options: it is simple, highly customizable, and it’s free. As it takes many parameters into account, it can be configured to fit most demanding environments. But it can also be used successfully with the default settings on simpler servers and databases. The jobs created by the Maintenance Solution automatically process all user databases on the server. So be aware of that if databases on your server require different maintenance scenarios. This article series will cover all three parts of this maintenance solution. In this part, installation and SQL Server Backup solution will be described in more detail. Before starting, make sure that all software requirements have been met. This should not be a problem, as the solution supports all Windows versions of SQL Server, starting from SQL Server 2005. It is also supported on all editions of SQL Server. Support for SQL Server 2017 on Linux is still work in progress. As mentioned above, the script installed the CommandLog table, four stored procedures and 11 agent jobs. The names for the backup jobs are pretty much self-explanatory. To confirm that these jobs are configured properly, it is best to run each job separately. As its name suggests, this job creates a full database backup of each system database. Since all system databases use Simple Recovery Model, it is not possible to backup their transaction logs. To run this job, right click on it in Object Explorer, and click on Start job at step… option in context menu. 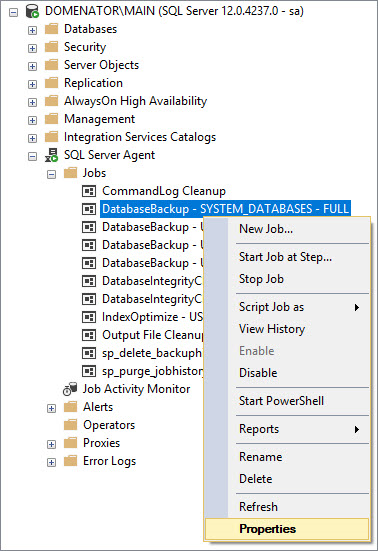 Creates one full database backup file for each of the user databases, regardless of the recovery model. The job is run from the context menu in the same way as in the previous example. A success message is generated by the completed job. In order to be able to run any of the created jobs automatically, and use the backup solution to its full potential, it is necessary to configure the schedule for each job. This step is left out of Ola’s script deliberately, as each environment requires specific backup schedule that heavily depends on predefined RPO (Recovery Point Objective) and RTO (Recovery Time Objective).